Get 25% More Simply Accounting / Sage 50 Cheques FREE! Sage Simply Accounting which is now called Sage 50 is an easy to use accounting program primarily aimed at small and medium sized businesses. The program allows users to track all Invoice, Receipts, Cheques, Inventory etc… Sage 50 is also used my many bookkeepers to keep track of their clients bookkeeping. Sage 50 is also offers both Desktop or Cloud integration. Clients have the ability to Track Customers, Create quote which cal then be turned into sales orders or invoices with just a single click. Their Expense management allows you to records all purchases and expenses so you don’t miss a payment allowing you to have a better handle on your cash. The program also allows users to print cheques on standard 8.5 x 11″ laser cheque stock. The program keeps track of all cheques and helps to reduce making duplicate payments on the same invoice. In Sage 50 / Simply Accounting you can allow the program to print your company name and address etc onto the cheque, or you can have your printer print those details instead. A main benefit of having your printer print it is that the cheque printer will print in a larger font, can print your logo in color if needed and it can be printed to better fit into self seal double window cheque envelopes. Give Sage 50 a try but purchasing online directly from Sage or through a retail store such as BestBuy or Staples. 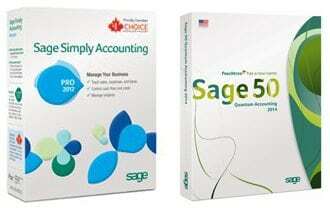 Simply Accounting / Sage 50 and all other software programs.